Isn’t Spring a strange word. It must be one of those words that have their roots far back, at the beginnings of speech. You know, just when we had begun to tolerate our teenagers going round saying “Ugh” to each other (and all the thirty and forty something-s had started saying it too – just to prove that they were not really getting old) someone, somewhere comes out with “Spring”. Now, IMHO, all of us who thought we knew where we were up to, are back to having no idea what’s going on, LOL. Spring, the kind you find sandwiched between winter and summer, not the kind that bounces around, or the kind that is coiled up and used for beds, or even the place where the water gushes out of the ground, has had one try at getting started so far. We had Im Bolg around February 4th. You know, writing was developed as a way of recording the sounds we make – as words, if I tell you that Im Bolg is actually pronounced im molk and it refers to the approximate date that ewe’s come into milk, can you remember how long it is since you had a bolg shake? Here we are at March 1st and Spring is going to have another go at starting. If all else fails there is still the vernal equinox on March 20th (in most places – might sneak over into 21st in some places) but that really is the last chance. Some can’t wait while Spring phaffs about, though. This Dunnock, singing his heart out on the hedge as we walked past today, has obviously become impatient with dates and times and has decided to just get on with it. Here in the English Lake District we have William Wordsworth. He wrote “I wander lonely as a cloud” about his sisters description of the daffodils they found on an April walk. He published two versions of it, actually. Like any good writer he was constantly tinkering with his work. A lonely cloud? In springtime? Over daffodils? I know she was only your sister and sibling rivalry is the rule. not even mention that you were together on that blustery day? Would she have written it differently if she’d had her say? that ‘I wandered lonely as a cloud’ would turn out to be one of your best. days, the olden days. The front-men stand, the saxes bark. Hey, Daff! Man. Swing it cool and sweet. Blow that horn! Pure gold! The music lives, forever young. It’s just me, that’s getting old. 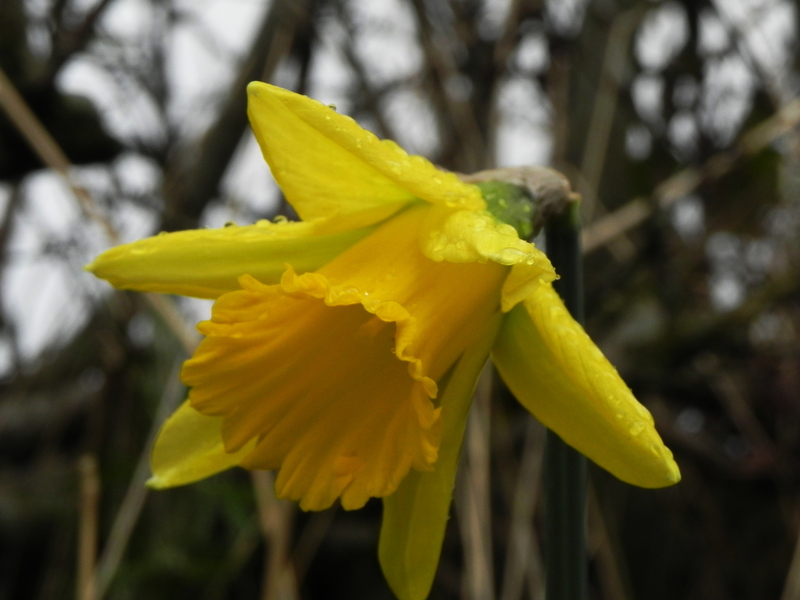 But I have to say that the daffodil poem I like best is Daffodowndilly by A.A. Milne (of Winnie the Pooh fame) who also wrote a very entertaining essay on daffodils in which he confided that they were his favourite flower. Some parts of the Internet place this poem in ‘Now We Are Six’ but it’s in my copy of ‘When We Were Very Young’. The weather this week has been awful. The RSPB was running its annual ‘Big Garden Birdwatch’ – on particular dates you are supposed to count all the birds you see in your garden over a continuous period of one hour – we didn’t have an hour with any birds in the garden at all on those dates. They were all, very sensibly, sheltering from the ferocious wind and driving rain. Because the weather dial, upstairs there, is set on ‘Random Selection’ at the moment, we have also had some clear sunny days during the week. We’ve done our best to synchronise our perambulations, we’re too set in our routine for them to be peregrinations, to the sunny periods and we’ve had proved to us, once again – sunny does not equal warm. It has been hard to find something that would risk a venture out, into even the brightest day, that we could use as a picture for your edification. We’ve seen our robin – we know it’s ours, as two robins are incapable of co-existing peaceably – and a batch of chaffinches who, on the whole seem to be able to settle disputes, vocally, but without recourse to fisticuffs. They appear, grab a beak-full of seed and wing it back to the shelter of the bushes. 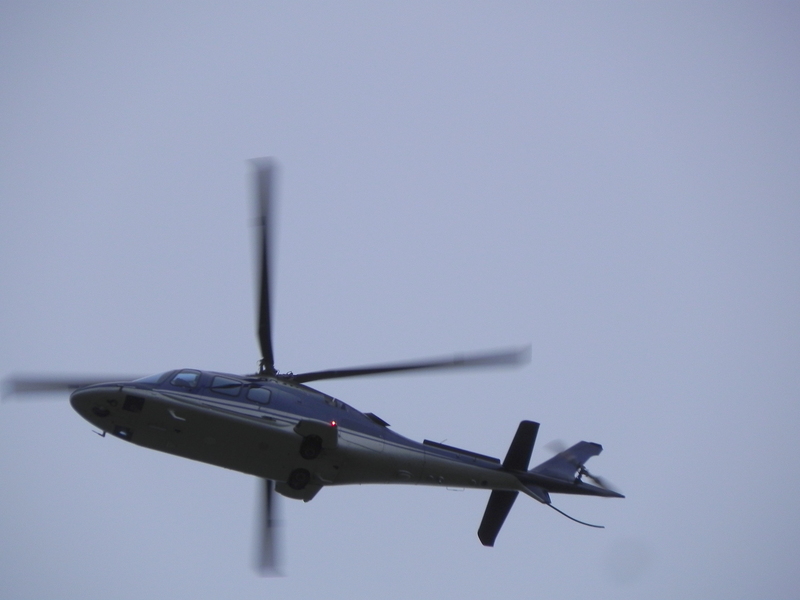 Then, on our walk this morning, quite suddenly, out of nowhere, this helicopter appeared. I grabbed the camera, wrenched the lens cap off, and pointed in the general direction (which was up, as it flew low, right over our heads) and pressed the button. I had this nice picture of Gorse. Yes, even in February this bush is producing flowers. So I shook Google awake and sent him off to see what he could find – for me to pass on as if I knew it all along. He found a few things. 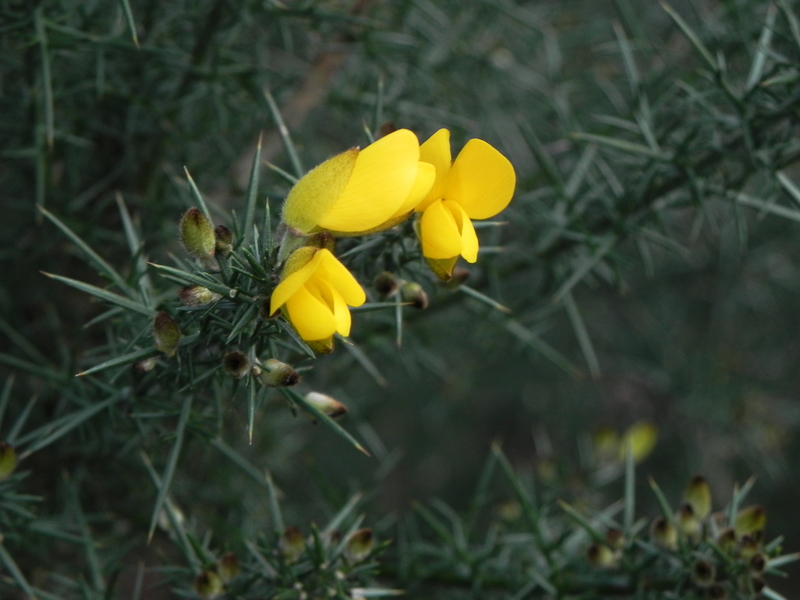 Did you know that we have three different types of gorse in the UK? One variety grows less than a metre tall and only in the south east, so this isn’t that one. The other two hybridise at the drop of a hat, I blame the bees myself – standards are slipping everywhere, so it is pretty pointless even trying to decide which one is which. If you look closely at the flower and think it reminds you of a sweet pea or runner bean, you would be quite right, Gorse is a legume. Like the rest of the legume family, gorse is into nitrogen fixing and if you occasionally cut it right back it will release some of its store back and enrich the surface soil. It is also into calcium, it will fish it out of the sub-soil and use it to give its thorns a bit of backbone. When it dies back it drops its thorns, and sprinkles the calcium around. It is actually, really interesting, if somewhat prickly, stuff. Chris Dixon of Penrhos in Wales, has a very interesting site here, with a whole page on how he uses it in Permaculture. Then there was Dr Edward Bach (1886-1936) who devised a system of Flower Remedies. Gorse, for him was the remedy for people who had lost hope. Indeed, a glimpse of the bright yellow flowers at this time of the year does lift the spirits. You find me in a quandary. What a strange word that is, do all words with qu sound like relics of a forgotten world to you? Then, there are all those words with gh and ght in them – dinosaurs all, stamping round swinging their massive tails and bellowing at the top of their lungs. You know, writing is just a way of recording speech. Someone, some-when in antiquity, sat there with his quill pen and wrote w r i t t i n g and then he chewed the end of the pen and wrote t h o u g h t.
Now, you can forgive him for adding the w at the beginning of writing, it was, after all the bleeding edge of human advancement, and they all had high hopes for it. Putting a w at the beginning made it special, and writing writing, with its w, made the writer feel special too. But why thought? They may have imagined that they had just invented thinking, every generation seems to do that, but if they wanted to give thinking a bleeding edge spelling, why not apply a little consistency? Surely wthort would have done just as well? 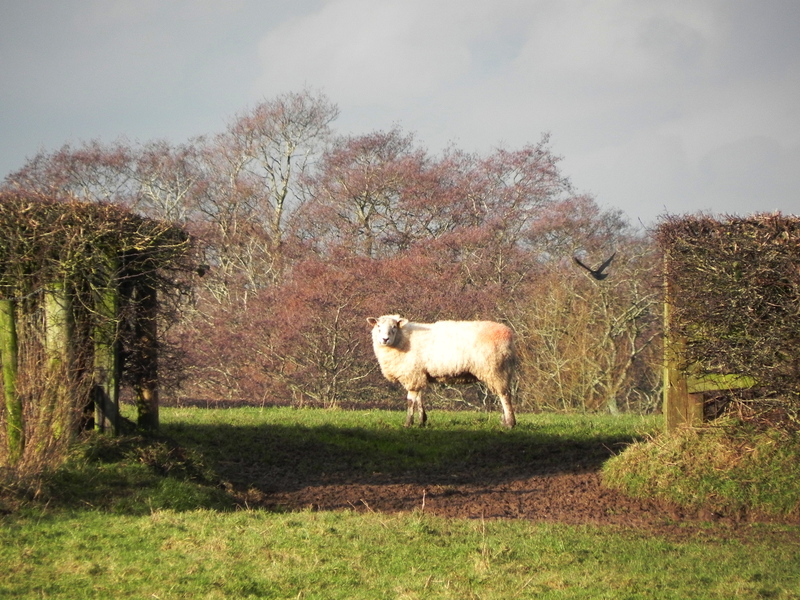 I must confess, for a moment I had considered pondering on whether a quandary had three or four wheels or perhaps a fur-lined collar, but no, the actual problem is – do I claim the brownie points for catching the sheep right in the middle of the gateway or the crow in flight?